"It was a dark and stormy night..." Ah, Snoopy! My inspiration! As a writer, I often giggle harder than I probably should at his constant use of this phrase as an opener. That's because he never failed to write, which I often do. 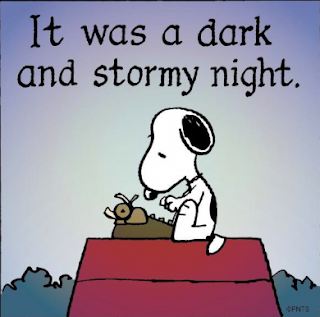 So, if I have to open with "It was a dark and stormy night...", then that's exactly what I'll do. The problem is, as Snoopy found, even the greatest of opening lines has to have something to follow it. I don't have a tried-and-true second line, so now I have to think. There have been a lot of changes in my life over the past year and, while some of them seemed frightening at the time, all of them have led me to be where I am in this very moment: peaceful. At the beginning of the year, I was troubled at my place of employment and struggling with the dilemma of whether to stay and continue being uncomfortable in my own skin or to leave and be financially in danger. I took seeing my family for granted, as something that I could do 'when I had time'. I often expressed bitterness, resentment, and, at times, downright hatred for a few select people in my life and when I wasn't expressing it, I certainly was feeling it in my heart. As much as I loved God and always knew to put Him first in my life, I was paying little attention to my own advice, and was trying to muscle around His plan to create some sort of amalgamation of His plan WITH my plan. That never works, just FYI. In May, I almost lost my little sister. It put everything into perspective. It taught me (rather, reminded me) to seek God first and everything else would fall into place. In my growing relationship with Him, He gave me the courage to do what I knew in my heart to be right: leave my current place of employment and trust Him to provide for us. After making God my first priority, my family was next, and I dropped everything else in my life to be with them. Nearly all of my relationships have done nothing but thrive since that point and, while I still have negative feelings from time to time toward certain people, I don't dwell on them. I turn them around into what I think God must feel toward those people. I have learned that loving God means loving others. It's my job to be His hands and feet. His arms are not closed off, and His face is not hateful. His heart is not hard, and His lips don't spout negativity. My life has changed dramatically and I'm telling you that yours can, too. Isaiah 43:2 says that even though we walk through the fire, it won't harm us, because He's taking care of us. He doesn't say there will be no fire, just to trust Him to get us through it. Every trial we face is honing us to be the person He meant for us to be. It's our faith in His ability to get us through that matters, not in our own abilities. He's shaped us to be who we are, and the first thing we are? Children of God. "It was a dark and stormy night..." but now it's not, because I'm basking in God's light. Give it a shot. You won't be disappointed.